Hello, biker babes! 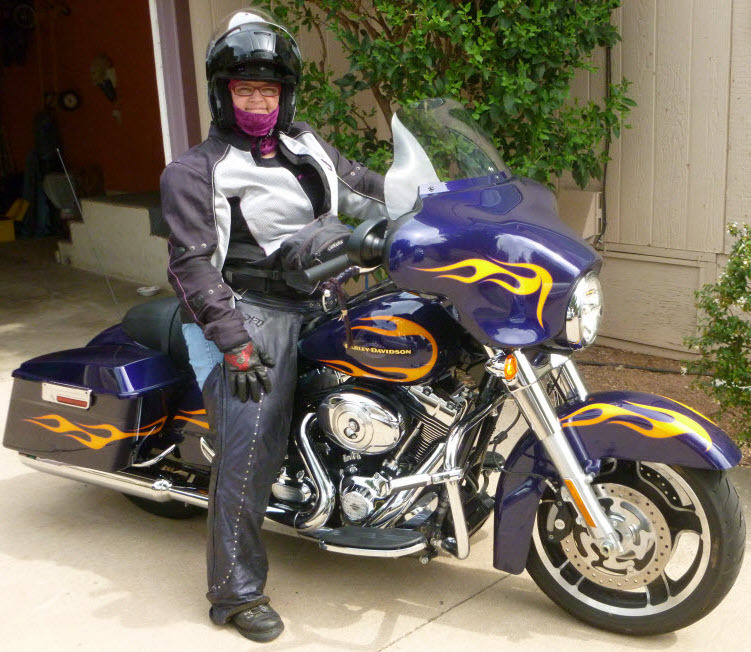 Your Biker Babe Tours lead guide is Liz Casey, long-time motorcyclist and adventure seeker who rides a purple, 2012, Harley-Davidson Street Glide all over the roads of this wonderful nation. Liz lives in Sedona, Arizona with her best friend and husband, Craig. She has over 30 years of riding experience on motorcycles of all types and sizes, from dirt to street and small to large machines. She has informally led motorcycle groups on rides of varying complexities and lengths for years. Liz is CPR/AED and First-Aid trained. In addition, she has completed extensive motorcycle safety courses (and continues to do so despite her many years in the saddle). As a small business owner, Technical Writer, and widely published author, Liz fantasized for years about getting out onto the open road with other women so that, together, they could feel the absolute joy and freedom that riding brings. Liz and her accompanying tour sweeps (“sweeps” are guides who ride in the back of the pack) want nothing more than to share the excitement and love of motorcycles with other women, to provide a space for women to connect with their inner selves while in the saddle, find their power in the roar of pipes, and return to their centers in the rush of the wind. An exciting tour>>>, is happening soon! Questions? Feel free to contact us>>> for more information. Be sure to visit the Biker Babe Tours Web site for tour videos, photos, and all the latest information: BikerBabeTours.com. GG! Oh, babe. I just replied to your other comment on BBB and suggested you come over here, but you already found me over here, too. LOVE that! You in Sedona? ABSOLUFREEKINGLUTELY! Yes, yes, yes, yes, yes. Did I mention YES? Oh, YES! You gotta come…ohhhhh, you will love it. If you are being called, there is a very good reason, honey. Not everyone gets the call, but eventually, the people who do, end up coming over. I, too, got the call some years ago, came over here, and about fell out of the moving car. OMG! The energy here is unbelievable. The art, the light, the food, the movement, the meditation, the hiking, the riding. Pure deliciousness. If you are obsessed with motorcycles, then this is the place. 300+ days of sunshine per year, wide, dry, and amazing roads and views around every turn, the best! I ride about 3-5 times per week, every week. It’s so friggen’ awesome here. I will find my way to Sedona, it’s been inexplicably on my mind for about five years.